Tennis star Andy Murray would consider becoming a coach after he retires - but said he might start a family first. The Wimbledon champion revealed his thoughts on the future during a live BBC question and answer session with school pupils from across the country. He fielded queries about everything from his favourite sandwich to his shoe size and said his triumph at the 2012 Olympics was his proudest moment. The event took place on the same day he was awarded the Freedom of Stirling. 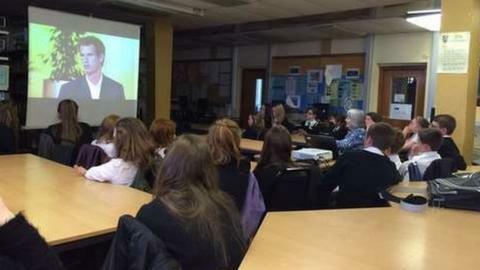 The session was held at Wallace High School in Stirling, where Murray revealed his favourite colour to be blue and said he occasionally spends whole days in bed eating yoghurt or ice cream. And when asked about a possible future in coaching after he retires from playing, he said: "I don't know, maybe. "I'd definitely consider it, but I'd definitely take a few years away from the travelling - maybe start a family, who knows?" The 26-year-old said that while winning Wimbledon last year was his biggest achievement in sport, he was most proud of his triumph at the Olympics in 2012. He said: "Winning the gold medal was probably the proudest moment for me. "In tennis we're all playing for ourselves, but when you're part of a team like Team GB then it's different. "It was a home Olympics and the atmosphere was different to anything I'd experienced up to that point." And Murray also urged youngsters to take part in sport, saying: "It's great for kids to play sport, to stay active and healthy."